There are art galleries that occasionally exhibit art work that is of Mathematical interest, and then there are venues that consistently show work with Mathematical elements. Central Booking located on the Lower East Side of Manhattan is an art space that always provides art work that any Mathematics enthusiast would appreciate. Executive Director and Curator Maddy Rosenberg has created two district galleries with in the space. The front gallery ABG (Artist’s Book Gallery) is dedicated to representing Artist’s Books in all of their forms and functions. 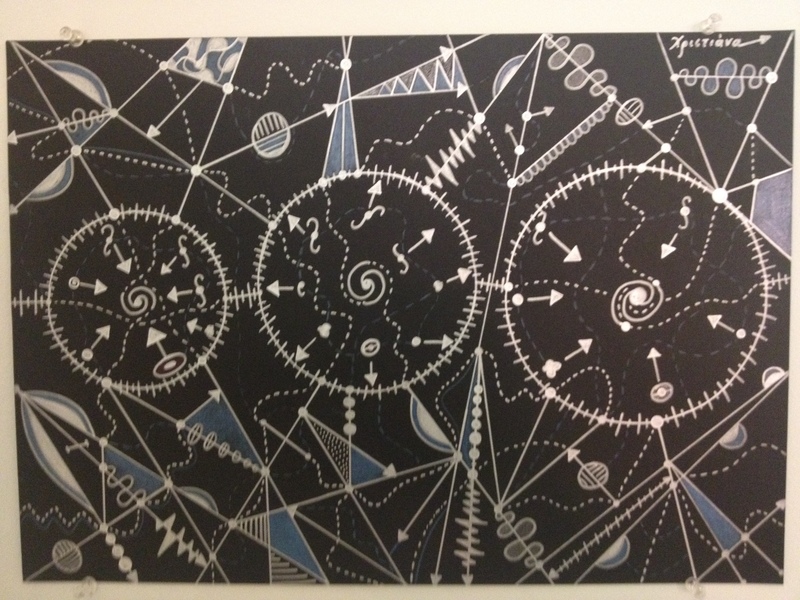 Currently on view is an amazing piece by famous MathArt collaborators, Eric Demaine and Martin Demaine. The sculpture “Through the Looking Glass” was made in 2013 and comprises of a folded paper form encapsulated in a blown glass vessel. I have seen their beautiful and complex folded forms before, but the introduction of glass takes their work to another level. The second gallery at Central Booking is HaberSpace,which is dedicated to Art and Science exhibitions. The close relationship to the visual representation of science and the Mathematics used in the study of science makes this the perfect place to find MathArt. The March exhibition “Time and Again” explores the Physics of time, as well as the concept of linearity. 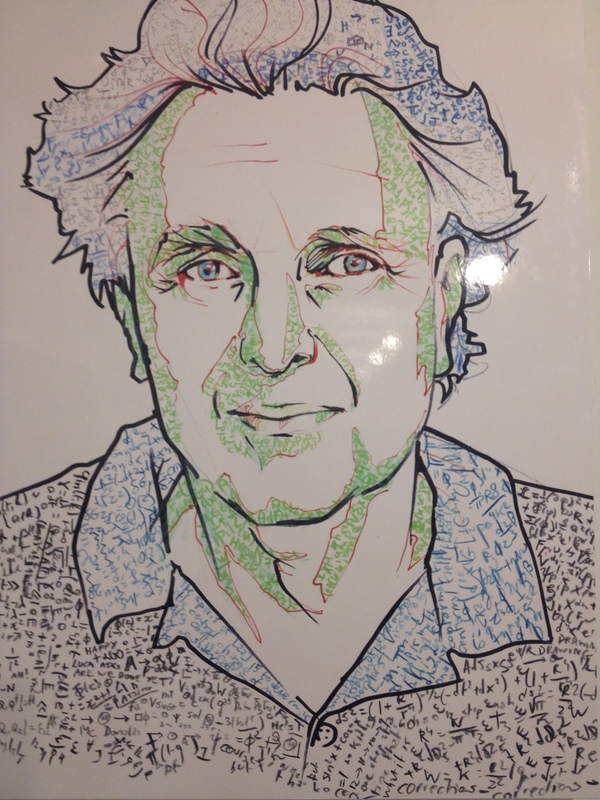 Illustrator Miriam Carothers draws pen outline drawings of physicists. The the spaces are filled in coloring book style with Mathematical equations that relate to the work of each scientist. Miriam Carothers. All pictures courtesy of the artist and the gallery. 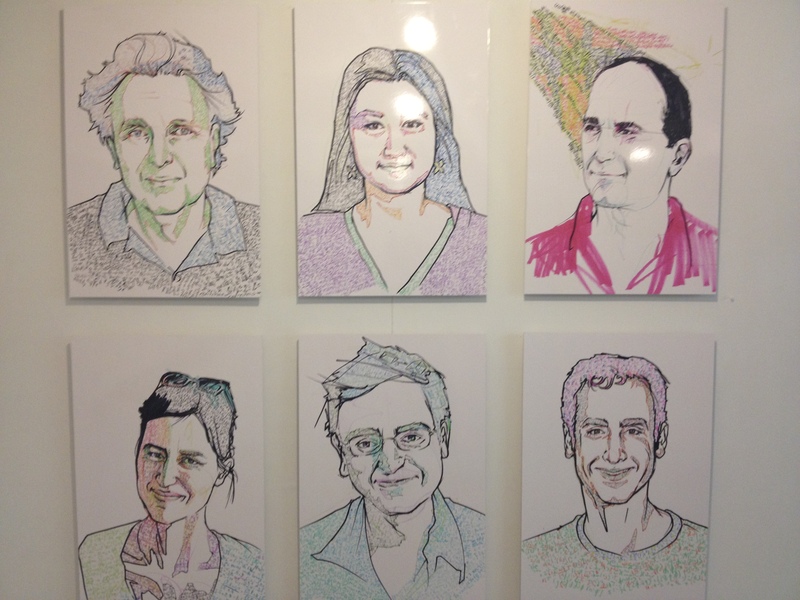 In 2011 Carothers made 30 portraits in this series using a team of physicists, Physics professors and students to fill in the mathematical formulae. Through this series of drawings Carothers creates a dialogue, not only about scientists as people, but also how society relates to the mathematical numerals and symbols that form the language of science. Miriam Carothers – Alexander Polyakor (2011). All pictures courtesy of the artist and the gallery. Christiana Kazakou explores the connections between science and art through many mediums, including site specific installations, performance art, architecture and what Kazakou refers to as “Science Maps”. Her drawing “The Past, Present and Future” (2010) is both striking and elegant. The white lines on the black paper create an interesting dynamic of positive and negative space.It features three circles with measurement lines ticking off degrees around their circumferences, like on a protractor. They seem to spin like the mechanism in a clock. Around the circles there is a background pattern created from playful angled vectors which connect to form a variety of triangles. Christiana Kazakou – The Past, Present and Future ( 2010. All pictures courtesy of the artist and the gallery. The exhibition Time and Again at the HaberSpace gallery was full of references to Mathematics and I look forward to exploring future shows.